The WCS Garden Fall Cover Mix is a complex cover crop mix designed to winter kill, leaving a surface mulch in the spring requiring little to no management prior to planting. Ideal for cool season vegetable spaces. This combination will loosen topsoil, protect your soil from winter erosion and nutrient loss, suppress weeds. The surface residue will provide food for soil micro and macro organisms which are crucial for healthy soil. This mix will winter kill in a typical Zone 5 Winter. Plant in August to mid September. May be planted around mature warm season vegetables to begin protecting the soil before your garden is put to rest. Trim up plants to ensure sunlight and water to germinating seedlings. 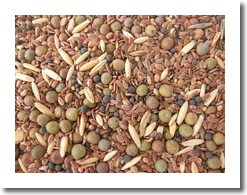 Combine seeds with provided inoculant and plant within 30 days of mixing. Lightly broadcast the seeds and work into the top one half inch of soil or cover with mulch or compost. Hand held broadcast spreaders are ideal for application. Drop spreaders are not recommended with the varied seed sizes. Seeds should have moisture equivalent to 1” of rainfall per week until seedlings are established. Do not fertilize cover crops as this slows down the nitrogen fixation of the legumes. If you have seed left over, reseal the bag and store seed in cool location out of the sun. 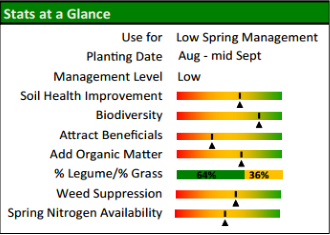 If planting after 30 days, the inoculant will no longer be viable and you should purchase fresh for your cover crop to fix nitrogen effectively. We are able to provide replacement packets. All species will die in a typical Zone 5 winter leaving a mulch residue requiring no management. Simply use a hoe or other tool to form a furrow to plant seeds. 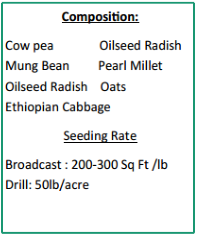 A light seeding rate may result in some annual weed seed germination, especially if you have biologically active soil. This will be evident is your surface residue is disappearing leaving room for weeds.